Canadian Jonathan Finn is thrilled to announce that he has re-signed with the XCtech Team to contest the 2018 RFME CEV Pre-Moto3 Championship. The 14-year-old from Bushell Park, Saskatchewan recently completed a full season in Spain earning five top-ten finishes and 11th overall in his inaugural RFME Campeonato de España de Velocidad National GP85/Moto4 season. Finn will be advancing to the RFME CEV Pre-Moto3 Championship in 2018, continuing his pursuit of representing North America and being the first Canadian to compete at this level. “My first year racing in Spain against some of the best riders in the world was challenging but also very rewarding. I’ve learned a lot and I’m ready to take on this new opportunity in the RFME CEV Pre-Moto3 Championship with the XCtech Team.” said Finn. 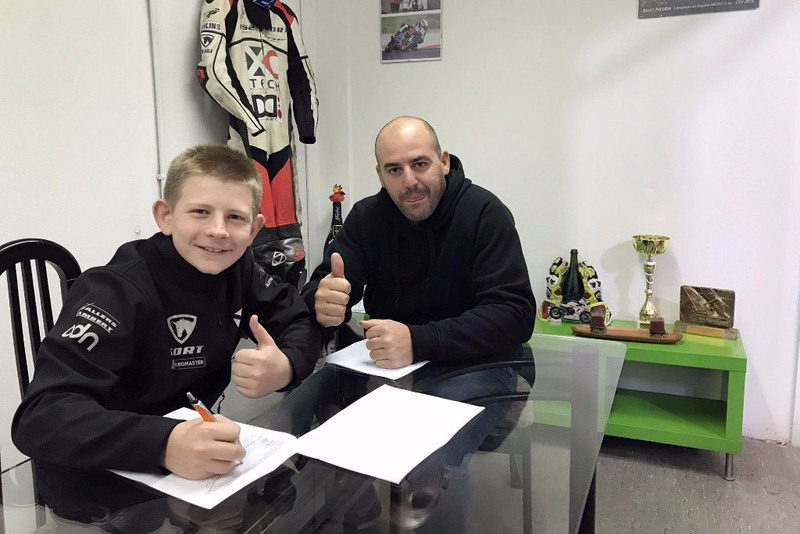 The RFME CEV Pre-Moto3 class is considered to be the proving ground for young Grand Prix motorcycle riders to perfect their racecraft before graduating to the FIM CEV Moto3 Junior World Championship. The difference between a Pre-Moto3 motorcycle and a full Moto3 machine is that Pre-Moto3 has limited electronics and restricted power output of the engine. The RFME CEV Pre-Moto3 Championship visits circuits across Spain with races at famed circuits such as Motorland-Aragon, Barcelona-Catalunya, Jerez and Circuit Ricardo Tormo, Valencia. Later this year Canadian road racing fans may get to see Finn compete on few home tracks in the Canadian Superbike Championship’s new Light Weight class. Details to be confirmed early in 2018. Jonathan is thankful for the support from Canadian Tire – Cobourg, Arai Helmet Americas, Bickle Racing, Impact Safe-T Armor, VnM Sport, Sidi Sport, and SPY.